The US Congress has passed a $167bn (£86bn) economic stimulus plan aimed at helping to bolster the world's largest economy and avoid a recession. The package includes one-off rebates of up to $600 for individuals and $1,200 for couples plus $300 for each child. The Senate voted to approve measures after a week of manoeuvring that saw agreements to provide extra money to retired people and the elderly. The House of Representatives followed suit a few hours later. Fast action was needed, politicians said, to limit the damaging effect on the economy that the credit crunch and housing market woes were having. 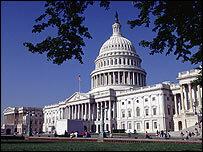 President George W Bush welcomed the passing of the bill and said it would help stimulate consumer spending. Treasury Secretary Henry Paulson also welcomed the approval, saying: "This package of payments to individuals and incentives for businesses to invest will support our economy as we weather the housing downturn." As well as the tax rebates, those on low incomes, who do not pay income tax, would receive a $300 payout, Congress agreed. The new measures were passed in a vote by 81-16 in the Senate, but only after Democrats dropped calls for more unemployment benefits, assistance with fuel bills and plans to offer certain industries tax breaks. The package passed in the House by 380 to 34. The approved package would "change the economic direction of this country", said Senate Majority Leader Harry Reid, a Nevada Democrat. Republican Senator Mitch McConnell said: "This is not a victory for Republicans or Democrats. This is a victory for the American people." However, some politicians are worried about the damage the plan will do to government finances - potentially doubling last year's budget deficit. "We have to remember that every dollar being spent on the stimulus package is being borrowed from our children and our children's children," said Republican Senator Judd Gregg, who voted against the bill.